Gift Guide Participation Home | About Us | Opportunities | Sponsorships | Contact Us! 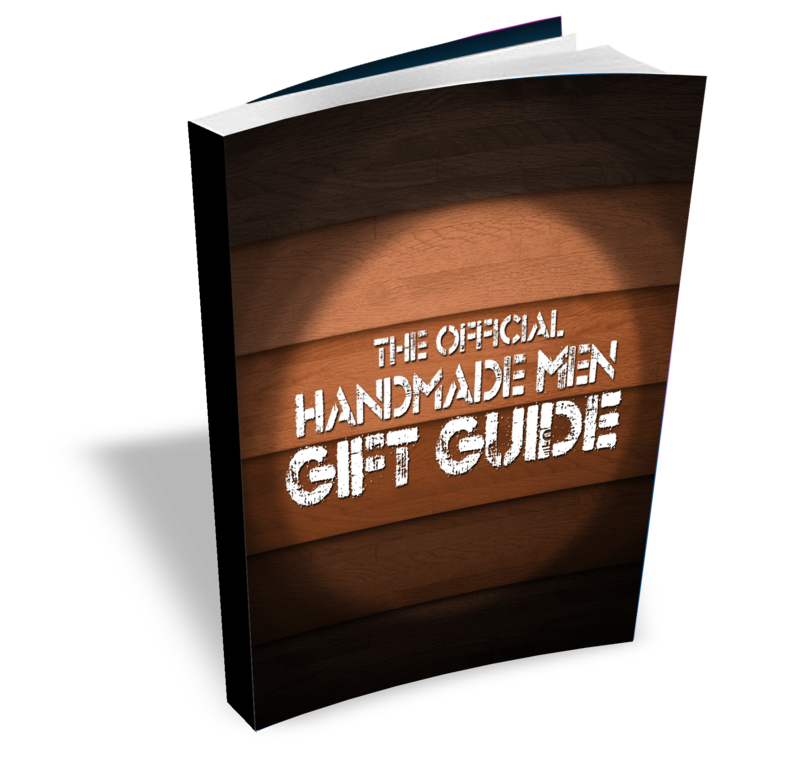 We are so excited to launch the next Handmade Men Gift Guide for Spring 2014! 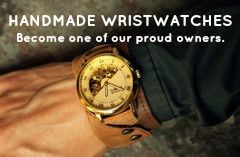 This is a great opportunity to get your shop and your products in front of our growing audience of qualified customers who already know the value of artisan work and are focused on buying for men. An exclusive full color listing including big 400×400 graphic that shows 4 of your favorite items in a lomo-style layout with a text blurb and link to your shop. 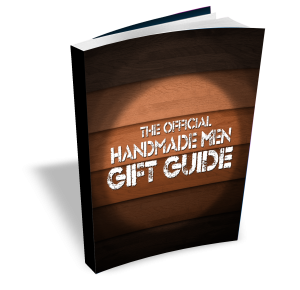 High quality PDF guide is 100% free to all Handmade Men visitors and will be featured on the front page of the site for the duration of the season in addition to being promoted to our email list and on our social media platforms. A dedicated link for you to share with your customers, fans, and friends so that they can get their own copy for free right from your website, blog, Etsy shop, or email message. High-value presentation with 3D cover design (image shown above is a sample). To ensure that each shop gets as much attention as possible, we will be offering a very limited number of spots each season. There’s no better way to reach out to a qualified target market at such a low price! Don’t feel overwhelmed by all this information. If you aren’t sure where to start, just contact us and we’ll be happy to help you out along the way! 6″x9″ Page size, high quality PDF digital format. Readable on computers and tablets or smart phones with free PDF viewer. 400 x400 (h x w), 150 resolution graphic image. Shop title header in bold (color upon request). 1 paragraph of text (optional). 1 hyperlink to your shop. We will open space for 10 shops in each of our 3 categories: clothing & accessories, grooming & hygiene, and fun & functional. We can design graphics for you if needed (see pricing section below). All reservations must be received and paid for by February 28, 2014. All graphics and text must be received by March 1, 2014. We reserve the right to refund or deny any shop based on compliance, aesthetics, or availability. We’ll be happy to offer our support and assistance along the way! 50% Off spot for any shop who sponsored a giveaway or review since August 1, 2013. We will limit the Spring 2013 Gift & Style Guide to 10 shops in each of 3 categories – clothing & accessories, grooming & hygiene, and fun & functional. Shops will be accepted on a first come, first reserved basis. All full-page spots are available for just $6 for our inaugural Spring 2013 issue and its full season availability! Please add an additional $3 if you need in-house graphic design done on your behalf. This will be done by the Handmade Men team directly. >>> Reserve Your Spot Now… We’ll Help Every Step Of The Way! A link to your shop. Where you want your ad to link to (usually your shop or website). If you need us to create your graphic for you, please let us know and provide any creative direction you like. We will base our design off of your shop and will be taking images from your shop for use in the graphic. If you have 4 items you want us to use, please note them with links. If you’d like to offer a discount code (highly suggested), please create it and include the code and its value in this message. Ensure that the code is good through June 21, 2014. If you sponsored a giveaway or review since August 1, 2013, please let us know. You’ll get your spot for just $3! Once we’re in touch we’ll work with you on getting your graphics, choosing spotlight images/listings, creating your text, and choosing where to link. We will help you every step of the way! Watch your email as we will reply with an approval and an invoice shortly. Feel free to contact us before you have your graphic created to ensure your spot gets saved. >>> Click Here To Contact Us Now!